I truly believe in buying as local as possible to create a more sustainable food system. So even though farmers markets might sometimes be more expensive than grocery stores, to me, it is worth it! I’d rather my money go towards supporting local farmers, plus the food is ALWAYS more flavorful than what I can find in the grocery store! I’m always scouring the markets for beautiful ingredients and this time, the bright yellow of the golden beets caught my eye. I love having California Avocados in stock at home and I knew that the soft texture and green color would play so well against the crunch of the raw beet and vibrant yellow (which I’m living in these days, btw). And thats where the idea for a cold, vegetable inspired carpaccio dish came from! I knew I’d want to jazz it up with a few more ingredients, but that the final result would be relatively simple and very easy to prepare. So, I grabbed a cucumber and some radishes to offer some more fresh crunch & pepperiness. Not only is this dish a beautiful sight to see, but you’ll be shocked at how simple it is to make! Now, I HIGHLY recommend doing this recipe with a mandolin. Surely, you could attempt to make this dish with a knife, but your cuts may not be as paper thin. I love using my mandolin for thin, even cuts. I even used it on the avocado! 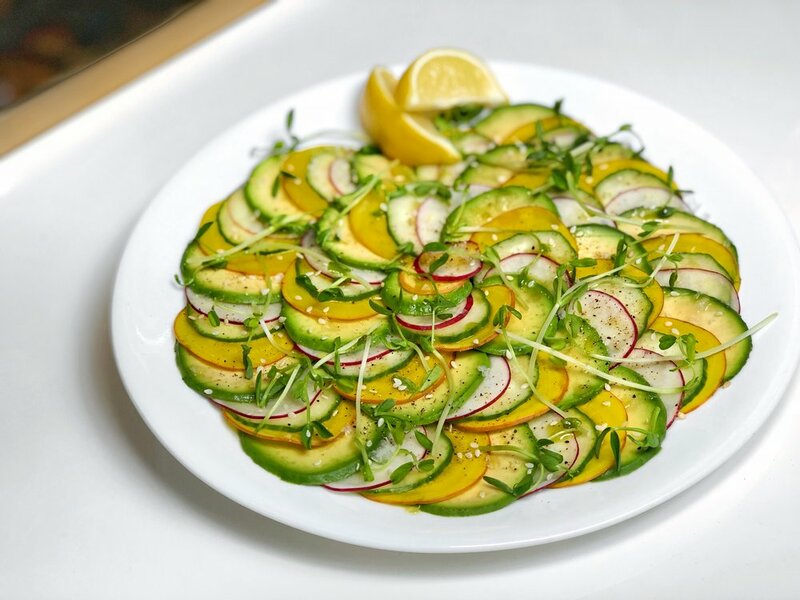 Hope you enjoy the recipe below and try this on a warm day, for a refreshing veggie appetizer or salad! Serves 4, as an appetizer or Serves 1, as a salad. Using a mandolin on the thinnest setting, slice the beets, radishes & cucumber into rounds. Slice off a small bit from the end of the avocado. Slice the avocado on the 2nd setting of the mandolin into rounds, until you reach the pit. Flip the avocado over and repeat with the other side. Remove the skin of the avocado from the round circles. Season by adding freshly ground pepper, flaky sea salt, fresh lemon juice & a drizzle of avocado oil (or olive oil). Garnish with pea shoots or micro greens and serve room temperature or cold!